Everything tastes better wrapped in bacon. And you can wrap anything in bacon- even vegetables. Case in point- asparagus. 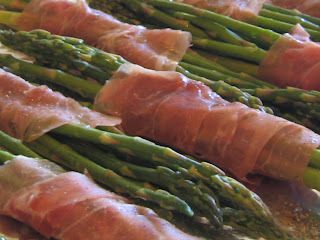 While asparagus is good on it's own, wrapped in a little prosciutto with a drizzle of lemon it becomes superb. Even my non-asparagus eating friends devoured these morels of tastiness. The best part is they are super simple, taking only minutes to prepare. And you can prepare them ahead of time, set them aside until ready to cook. Pop them in the oven for about 20 minutes and serve. Call it a side dish, use it as a salad or serve it as an appetizer 'cuz these little bundles are cute enough to stand on their own. You'll look like a genius and your guest will be fat and happy! Line a sheet pan with aluminum foil. Wash your asparagus in cold water, break off the tough end of each stalk by bending it until it breaks. 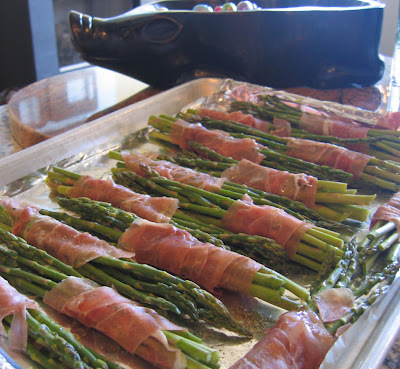 Lay down one thin slice of prosciutto, place a small bundle of asparagus on one end of the meat and roll up keeping the wrapped portion mainly towards the thicker end of stalk. Place on the pan, rotating the wrapped end opposite of the last. Repeat until all bundles are rolled. Drizzle each bundle with olive oil, and then squeeze the juice of the lemon over each bundle as well. Add fresh ground pepper too, the prosciutto is salty enough so don't add any extra. Set aside until ready to bake. Place in a 375 degree oven for about 20 minutes (check the doneness of your stalks with a fork.) The prosciutto should also be lightly crispy. Serve.